This site represents comprehensive explorations of biblical scripture and faith, examining both the Hebrew bible and the New Testament. Much of this material has been presented at Westlake Hills Presbyterian Church in Austin, Texas. The story of Issac's wells below contains an explanation for why we decided to call our class The Third Well. 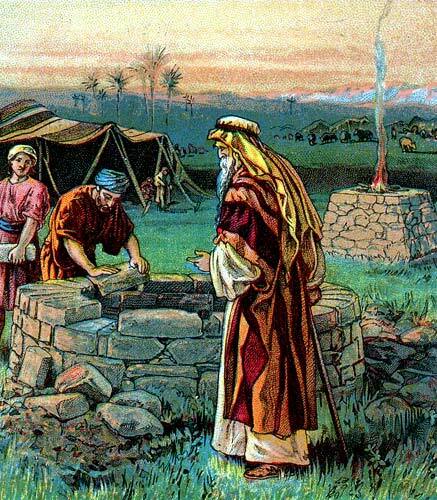 19 Isaac's servants also dug in the Gerar Valley and discovered a well of fresh water. 20 But then the shepherds from Gerar came and claimed the spring. "This is our water," they said, and they argued over it with Isaac's herdsmen. So Isaac named the well Esek (which means "argument"). 21 Isaac's men then dug another well, but again there was a dispute over it. So Isaac named it Sitnah (which means "hostility"). 22 Abandoning that one, Isaac moved on and dug another well. This time there was no dispute over it, so Isaac named the place Rehoboth (which means "open space"), for he said, "At last the Lord has created enough space for us to prosper in this land."" So - through the ages, sages have speculated - why did the Author of Genesis tell this little story of the wells? These verses could be taken literally, of course, but the sage Ramban, among others, saw future meaning in these different wells. The first well, Esek (contention), is representative of the first Temple, which, though a well of living water (or as Jeremiah would say "a fountain of living waters, the Eternal) was destroyed. The second well was called Sitnah (enmity), which might represent the second Temple, which was destroyed. The third well he called Rehoboth (spacious) could be representative of the future house, done without quarrel and with which God will enlarge the borders, broader, winding about higher and higher (perhaps as a Third Temple in the future). This could mean a fulfillment of the prophetic dream we discussed in our study of the prophets, of a time when all peoples will come to worship God with one consent, or, for Christians, a fulfillment through Jesus. This interpretation of the "third well", represents the quest this class is pursuing as we study the Torah Portions - learning together of a possible future in which all people of faith will come to worship God with one consent. The words of Torah are but its clothing; the guidance within them is the body. And as with a body, within that guidance breathes a soul that gives life. As our class has spent the year in an in-depth study of the Torah by going through a complete cycle of all the portions we have learned (from experience) the value of these words. And we have continued in all of our studies to "dig deep" into the scripture, and to not give up until we think we have found the soul of the words of each important verse.